As the last few entries in the ongoing series of interviews on screen graphics and fantasy user interfaces have expanded to cover the world of episodic television, I wanted to explore yet another part of the field – animated movies targeting younger audiences. 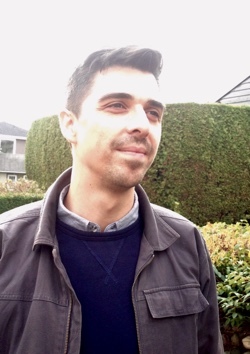 Justin Kohse is the perfect person for the task, as he was responsible for all screen graphics in “Escape from Planet Earth” that was released in 2013. In the last few years he also worked on the TV show “Stargate Universe”, as well as on feature films “Transformers 4” and “The Interview”. In this interview Justin talks about splitting his time between various creative fields, the relentless pace of production work in episodic television, joining an existing visual universe of “Transformers” and working within it, the various aspects of working on an animated feature film where the limitations of physical sets are lifted and what effect that has on the creative freedom to dream up the screens that support the story, and his overall thoughts on the world of fantasy UIs and the transformation that world is undergoing as our everyday lives are inundated with ever-more powerful screens. Justin: I grew up on Vancouver Island and got into video editing at an early age. Eventually I wanted to figure out how to make title sequences, build graphics, and animate. That’s what sent me to the Vancouver Film School [VFS] back in 2008 to study digital design. After graduating I worked a couple of part-time jobs and freelanced until I found a full-time gig on Stargate Universe as a Motion Design and Playback Artist. After that I continued in the FUI direction and found myself at Rainmaker Entertainment working on Escape from Planet Earth designing and animating for a 3D animated feature. Wanting to change gears I applied for a job with Gloo studios as a VFX generalist where I worked with a team of VFX artists and Motion Designers on something different almost every week (Screen replacement, compositing, explainer videos, 2D and 3D animation, etc..), Later on I moved to West Media Film and Post which allowed me to jump back into the FUI pool to continue working in television and on features and for the past year I’ve been working as a freelance motion designer. Kirill: It feels to me that there was so much available in the digital world, from powerful and inexpensive cameras, to ubiquitous desktop and laptop hardware, to very versatile suites of software tools. Was that a good time to be getting into the field? Justin: There seemed to always be an old computer hanging around the house. I could always find a way to get my hands on video editing software, my mother is an artist and a graphic designer as well and with that it gave me access to the earlier versions of the Creative Suite which I would say is what largely led me to where I am today. I wasn’t sure if it was a good time to be getting into the field but it felt like something that could push me further with skills I already had. Screen graphics for “Stargate Universe“. Courtesy of Justin Kohse. Kirill: I never went to a film school, so I might be stabbing in the dark here. Was it more on the theoretical side of things, or on a more practical side? Justin: The digital design program at VFS I would say was more on the practical side. It was largely an overview of web/print design and multi-media. They taught you a scripting, how to shoot on green screen, advanced photoshop, illustrator, after effects, with a bit of art theory and history sprinkled in. Three-quarters of the way through you pick a direction and I moved towards motion graphics. Kirill: When I went into university to study computer sciences back in mid 1990s, there was all of a sudden a lot of money getting into the software industry as the World Wide Web was becoming a thing. I remember there were quite a few people in my classes being there because of that promise of money and not because they wanted to be programmers. And a lot of those people fell away after a while. Did something like that happen in your class as people got to see what it actually takes to do digital design as a profession? Justin: At VFS we were thirty when we started, and when graduation day came around it was down to twenty one or twenty two? So a lot of people kind of realized early that maybe it wasn’t for them. It was also a one year intensive and it was an intense experience but i’d say it was definitely an accurate look at the pace of working in the industry. I was 19 and wanting to expand on my skills more where there were many students advancing themselves that had already been working for years as professionals. Kirill: Would you say that there’s a certain mindset that is better suited to this field? Is it a solitary endeavor, or perhaps the constant pressure to come up with something creative and new all the time, all the while you’re fighting against the limitations of the software tools that you’re using, or the pressure from the production side to get stuff done? Justin: Absolutely, there’s a ton of pressure when you’re working on large and small productions especially within television timeframes. Some people are quite happy with doing a certain thing for a long period of time where you don’t need a refresher project every now and then. But I find that I’m someone that needs to bounce around a little bit and dip my hands in to different pools to stay current and that takes a certain mindset and focus. Kirill: As you work on a project, how much time it is you on your computer and how much time it is you with your group collaborating and bouncing ideas around? Justin: That changes a lot. 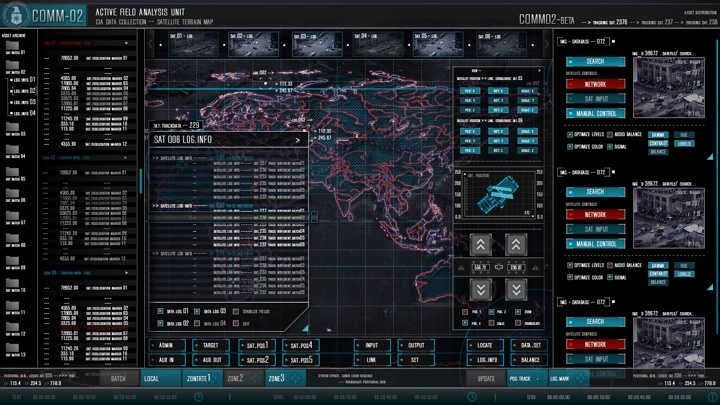 It feels like a lot of things vary in the industry, especially with fantasy UI [FUI]. Like on “Escape from Planet Earth” it was just myself designing and animating then I’d pitch my ideas to the Art Director and there would be guidance from there, but it was still just myself creating assets so that made it stressful. Stargate Universe was a lot of fun as there were weekly meetings with writers, directors, and vfx artists where my last full-time job had me largely working with another artist and a lot of email back and forth. Kirill: As you work within a larger production, a delay on your side means a lot of money wasted in all the other departments around you, so you have to stay on schedule. Kirill: I keep on coming back to “Sky Captain and the World of Tomorrow” which was made in 2004. It was headlined by top-caliber actors, shot all on green screen and everything was “inserted” digitally in post-production. And I remember there was this implied promise that we’re just on the cusp of being able to dip into these vast libraries of digital artifacts and create any story we dream of, all within the computers without the need to go on locations. But that hasn’t happened, and it doesn’t look like your job is becoming easier in the sense that you need to stay creative, think on your feet and keep up with ever increasing demands from the production side. Justin: That’s true. That’s one of the reasons why I wanted to bounce around a little and try to stay fresh. I was there for the first couple of seasons and it was my first experience with it all. I discovered the playback universe from Lisa Nolan who was moving up at the time into 3D and VFX, Seth Molson came in a bit after that right around the time I was pulling my hair out trying to figure out how to do all this stuff [laughs]. Graduating from Vancouver Film School and jumping into that pool was quite stressful at the time, eventually you’ve go to give it all a shot and try not to focus so much staying creative. Short turnarounds seem to push you in ways that you never knew were there. Kirill: If you look back at your expectations coming into the industry fresh out of school, how much different the reality turned out to be? Justin: I grew up in a small town and I didn’t have a lot of exposure to the film industry and coming straight out of school I would have never foreseen attaching myself to the film industry and playback. The move into motion graphics was bit of a stumble and then I almost fell into the job at Stargate Universe because, to be honest, I found it on Craigslist. There was a job posting titled “Motion designer/playback artist”. I knew what a motion designer was, but I wasn’t so sure about the playback artist part… The reality soon came to be short turn arounds and a lot of late nights and early mornings. But we got to walk around spaceships so it all evened out in the end and made it fun. Kirill: You took a break from the world of screen graphics after doing the first two seasons on Stargate Universe. What made you come back? Justin: I got an offer on “Escape from Planet Earth”. It was a different challenge, just because the movie was a 3D animated feature. Stargate we were working largely live and on-set, and things had to function where at Rainmaker you all of a sudden had complete control and largely where confined to only a frame counts. Screen graphics for “Escape from Planet Earth“. Courtesy of Justin Kohse. Kirill: This is interesting for me as well for this series of interviews, as I haven’t considered up until now looking at and talking about computer interfaces in animated movies. It’s an interesting subject because when you remove the physical boundaries of the screens, there’s all this freedom of shape and form of surfaces for you to play with. You can put pixels wherever the story goes. Justin: I largely take a lot of reference from real world software, even down to cell phones. Sometimes you have a scene that is similar to something already in the real world, but it can’t really look the same visually but you need to think about that real-world function before you dive in. I find creating purpose behind the screen tends to make it easier to start building it out in the beginning. Kirill: Who did you work with on that production, and what did you work off of? Justin: They had a lot of sets that were already largely designed, characters were already animated in a lot of scenes involving any screen interaction. There was a set of sixty to seventy empty screens in one room so there was a general tone and feel to build off but it was largely a blank slate. It was nice having all that material to work with, but it would’ve been great to come in a little bit earlier as things were being built so that we could build out some of the actions and early concepts together. It was a catch-up to where they were, and then try to finish everything on time. I met with art director Matthias Lechner, he was really great. He would check in, but mostly would see that things were on track and say that everything looks great and tell me to go crazy or would help me push something further. The director Cal Brunker would come in to say that we’d have a new scene, and could we have this or that to add or take away from something previous. It was fun to be included in this process as a motion designer and be given the chance to work with such a talented team. Kirill: My impression is that as you’re working on screen graphics, you’re usually constrained in the choice of colors that has to blend into the overall color palette of the scene. But in the world of animated movies that target young kids it sounds like you can go crazy with vivid, saturated blobs of color. You get to explore this side that is almost unrealistic to happen in real-life software. Justin: That was one of the key things that was given to me at the beginning. As I met with Matthias for the first time even during the interview process he showed me all the sets, there was this world that was put in place and he really stressed that it had to be targeted for children. So minimal text and a large focus on shape, color, and movement. That’s why it was such a refreshing experience after having worked on SGU. It was such a technical and dark universe, where moving into “Escape from Planet Earth” you had a chance to try new things. You didn’t have to worry so much about making sure that this box of code is correct for whatever scene may be happening or background checking scientific equations. It was shapes and color with a rare bit of text if there was a story point or hero action. Kirill: And from a technical perspective, was it any different in the flow of work and the artifacts that you were producing, as the interfaces you were producing didn’t need to be projected onto physical glass surfaces? Justin: It was a different flow. Normally I’d create MOV files or image sequences and pile them in Adobe Director to play on set. But the flow for an animated production was more simplified, I could render my sequences and pass them off to someone to surface or texture them on set. It was a bit of a pain if there was a mistake though. Kirill: As the world of software you’re working with is evolving very rapidly, do you worry that you won’t be able to open the files you’re working on today in 20-25 years? Justin: Everything is saved and archived along with the movie or the television show in the end. I would work on provided equipment in house mostly and it’s a difficult process to pull work for your portfolio. Once archived I don’t think those files would be updated over the years as the software and tools evolve, eventually they’ll get pushed back to a point where you might not be able to open them anymore but you still have the final movie or show in the end to reference later on. It’s honestly something I’ve never really considered before. Kirill: What was your next production after “Escape from Planet Earth”? Justin: Gloo Studios, working largely with CollegeHumor.com and whatever else would come through the door. I was a visual effects generalist. Some days it would be screen replacements for phones or tablets, other days it would be tracking blood and bullet hits, explainer videos, 2D or 3D animation. I took the job to mix it up! Each project taught me a different skill. I remember roughing out a scene where someone was getting hit by a car for a music video, those opportunities don’t come up often when you’re surrounded with FUI’s. I thought it would give me a different perspective on things and push me to learn something new. It did push me to dive into Cinema4D quite a bit more. Kirill: And “Transformers” was after that? Justin: Yes, Gloo was fun, but I ended up getting an offer to come and work at West Media alongside Corey Bramall. He’s the mastermind, really behind the look and style of for a large number of those scifi productions. We had created a lot of content together but the tone and feel was already locked into the 4th instalment of the series, although the content needed to be different. 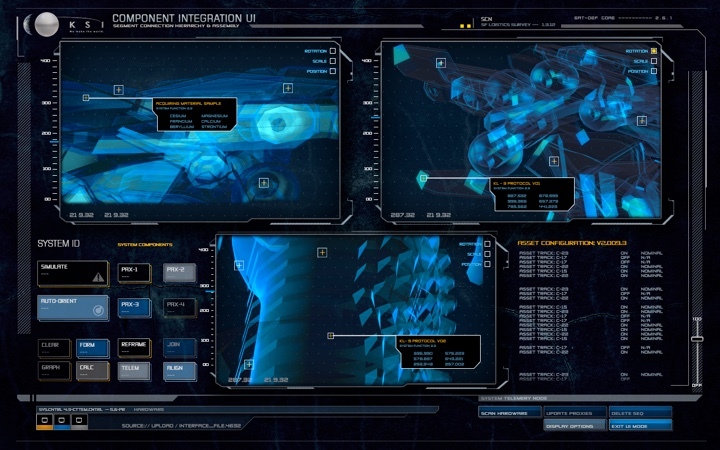 Screen graphics for “Transformers: Age of Extinction“. Courtesy of Justin Kohse. Kirill: But you don’t want to keep repeating what was already seen in the previous installments. Justin: the directors and production didn’t want to push too far from a certain look and you need to roll with what reference has been given sometimes. It was a lot of fun, and there was always a lot to work on, but sometimes you didn’t get to play so much. There’s a lot of reference beforehand and there’s a certain style that people are already looking for. So you do the best you can with what you’re given. Kirill: To me it feels that in “Transformers” the screens are not as prominent characters in the story as they are in the Marvel universe, especially for Tony Stark that lives surrounded by screens. So you work for however long you work on a movie and then your work either flashes by quickly or is blurred into the background of the set. Is there a certain element of disappointment that the work doesn’t get the placement it could’ve? Justin: Sometimes, a good portion of these screens are either background noise and eye candy. Every so often there is an occasion for pushing a certain part of the story through a screen. You work on these for quite a while as things get technical at times, and at the end you see it for few seconds. But it’s the idea that it’s meant to fill out the space than anything, sometimes you only need a few seconds to move the story a long. Kirill: And that brings me to your work on “The Interview”. I watch a lot of movies and recently I’ve been noticing that those set in the present time are getting more and more UI screens in them, most probably reflecting what is happening around us in our everyday lives. If you don’t show screens, if people don’t have phones or tablets or some really good looking thin display on their office desk, it feels unreal. Would you agree with this, also in the specific context of “The Interview”? Justin: Yes, absolutely. You almost find a comfort in that. We’re sitting here talking, and I have a laptop and a phone, secondary monitor, and a TV all in one room! there are screens everywhere and you’re existing around them all the time and you get used to it. So when there’s an absence of it, it goes noticed. “The Interview” was definitely a challenge. It came in later and I got to lead a little bit more on that project. That’s why you see the color pallette is a little bit different from say Transformers. I tried to squeeze in little bits where I could. Not having so many screens in there feels like cheapening things now. You get a lot of feedback from the directors to add more. It is never less. You try to balance the design and give some negative space, and they would ask why that corner is not filled up with something, so I would fill it with a button panel or something blinking and everyone walks away happy. Screen graphics for “The Interview“. Courtesy of Justin Kohse. Kirill: So you’re coordinating the story that the interfaces are telling across that much more space and across that many more screens. Not every viewer is going to pay close attention to all the screens on the set, but you do want to tell a coherent story that flows through the screens. Justin: Sometimes when I’m watching a movie, I end up getting lost in a screen or something [laughs], and I have to come back to the movie. I can’t even help it now. As for creating a general feel? There are other people that we work with, including operators. Also there’s usually someone on set taking it all in and providing feedback, we’d be back in the office getting updates of the set. You try to see how it looks and generally feels and then make changes based on visual appeal and it still needs to make sense in the end. Kirill: And on the flip side of having so many screens around us, people want some kind of escapism when they go to see a movie. They want to see something that they don’t necessarily see all day long around them. Is that a challenge for you to create something different, something just beyond the edge of what people have right now because otherwise it might be boring for me as a viewer. Justin: You always want to get leave the movies and have had that film excite you. Jumping around different studios and learning character animation and gaining a deeper knowledge of 3D is how I would mix it up myself and try to bring something different to the table. I can’t say that it’s not tiring to try and come up with a different looking FBI set or something [laughs]. That’s where it really becomes a job after a while. Sometimes you just have to push through things and get them done. And the larger productions like “The Interview” come along where you get a little bit more creative leash and largely happen on a bigger scale. It would be fun to work on a project like Escape from Planet Earth again as it allowed me to really create something different and unique. Kirill: What specific interfaces did you work on for “The Interview”? Justin: I had designed for the US side and in the FBI war room. Corey Bramall joined on a little later and we finished out set’s together, he also led the North Korean side. We had a broadcast room and it was supposed to have been there for quite a while. There was a lot of outdated technology, so you go with that feedback and design outdate FUI. Kirill: You meet somebody new at the party and they ask you what you do. What’s your 10-15 second pitch on how you describe what you do for a living? Justin: I usually start off by saying that I’m a motion designer or a motion graphics artist. I’d try to ask if they’ve seen movies such as “Ironman” or talk about the HUD elements in his helmet, or stuff in CSI when they’re searching criminal databases. When I say “Access denied” or “Access granted” they’ll nod and generally get the idea. 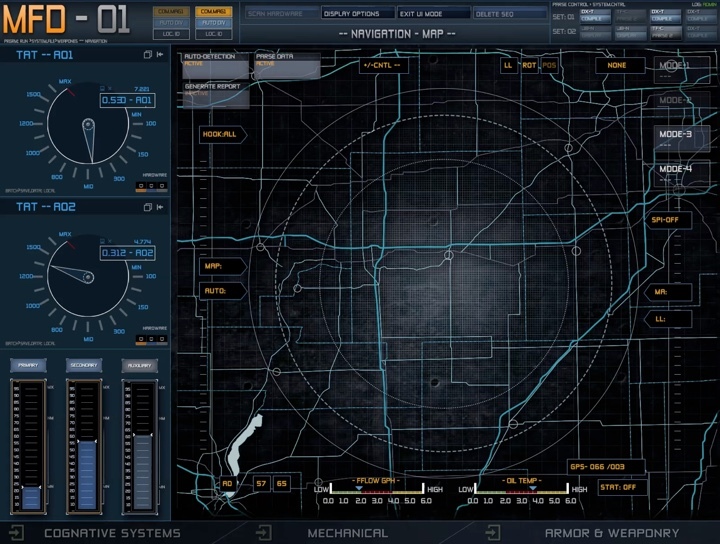 Fake User Interfaces for film – mostly is what it comes down to. And if that doesn’t work, I’d say that I design and animate for television and film. Kirill: What are your thoughts on the term itself of fantasy user interfaces? Does it capture what you do? Justin: I picked up the term from Mark Coleran and listening to his talks on FUI. It’s a term that I think got everything started, but you don’t really find it a lot, at least in people’s portfolios. You don’t hear people calling themselves fantasy user interface artists. I tend to stick with Motion Designer. Kirill: What would you prefer to call yourself? Playback artist sounds like you take what somebody else did and press the “Play” button to run it. Justin: [laughs] That’s where, I think, it largely came from, especially in the Vancouver scene. It started getting technical once sci-fi came into the picture and you had spaceships like on Stargate. I was coming at it from an motion background and to find jobs in Vancouver I had to use the term “playback artist”. But Gloo and Rainmaker had hired me as a motion designer. Playback is more of a live on-set term I think. Kirill: If you look at the way you work with computers these days, for work or for leisure, is there anything that stands out as a sort of a pain point that can be addressed to make things smoother and easier? Justin: Communication-wise I really like the way things are generally moving. I remember having to talk to my friends through MSN and AOL chat [laughs] and being amazed by text messaging. Largely things have become a lot better in a short amount of time, So it’s difficult to complain. Simplifying seems to be the wave of the future and moving towards more interactive platforms eliminates the keyboard and mouse. Kirill: How do you feel about the ways we express our intent to the computer that has gone largely unchanged over the last 30-40 years, with a slab of glass, a keyboard and some kind of a pointing device like a mouse or a stylus? There’s been a newer generation that has grown with the touchscreen world. You give the kids something that isn’t touchscreen and they’ll interact the screen right away. You have movies like “Minority Report” and people touching glass panels – that is something that we intuitively do. We like to interact with what what’s in front of us and if you can cut away the middleman such as a mouse or a pen, I think people would like to have that more connected experience. Kirill: Which still leaves us within boundaries of those slabs of glass. What about the kind of voice-powered and a practically invisible assistant from “Her” or the recent explorations in the worlds of augmented and virtual reality? You move away from the notion of a piece of glass as the interface into the machine world. Is that something that is interesting to explore for you personally? How can we bridge the gap between us wanting the technology to help us do something and having to be very explicit in how that technology is helping us? Justin: People go to the IMAX and are surrounded by the screen, completely immersed in the experience. The video game industry seem’s to be exploring this side of things a little more and you’re starting to see some really interesting applications with VR. We keep making sci-fi movies, and that seems to have a large influence on our tech. The influence from Star Trek you think about their communicators and the way our cellphones are now. A certain idea in a film may push a new piece of technology or a different way of looking at something. Kirill: You’ve mentioned this already in passing earlier, and I’m coming back to that. How hard is it for you to go into a movie theater and enjoy a production with user interface without getting distracted from the story to look at the screens? Justin: I try to. It’s hard. You watch something with people, and a friend or family member would nudge and say “Look at the one over there, oh look at that one over here!, I wonder who did that…”. Sometimes I even go to a movie with the intent of knowing there are screens in there and not even caring about the movie so much. There’s going to be some cool user interface stuff in there, so I’ll go. I find I can’t turn it off now. It’s kind of stuck in my brain. Just the other day I was watching “The Flash” and “Arrow” with my family and they asked me if I knew who made it – “Robyn Haddow“. It’s integral to my life now and it’s difficult to turn it off. Kirill: Do you find there’s still enough space to make new things and not to repeat what was done before? There are so many screens around us, and there are so many screens in film and TV, and there’s this expanding playbook of sorts of how to portray interfaces. Are you in danger of running out of ideas on how to portray these interactions? Justin: I don’t think I’ll run out of ideas, but I think the market definitely is getting more saturated with people who like doing this kind of work or aspire to. There’s been a larger push lately, especially with Gmunk and the TRON FUI work. It seems like a lot of people use that as a reference and it still fills up my pinterest feed. There are a few staples, including the stuff that Ash Thorp has done. Those are some of high-end movies and a lot of times you get those references right up front. “I want it to look like this” and you’re kind of stuck to work within those boundaries. Kirill: But I’d imagine that the director or whoever is saying that doesn’t necessarily want to have the same exact thing. That’s not very creative. Justin: You would ultimately want to design something different. There seems to be a kind of a universe where it all lives now. Maybe there needs to be a bigger push with it into a different direction. At least a few projects that I’ve worked on recently have been from reference, from what we already kind of have. It’s “we want our version of this, we want our version of Oblivion, that was really cool” and by the time you get down to the final product, it’s a very similar style. That could just be because of short turnaround times in the productions. Time is your enemy, and sometimes you don’t have time to play around with and experiment as much as you’d like. Kirill: It might also be built into the script. Let’s say that “Ironman” has cornered the market of helmets and HUDs. Maybe there’s a fresh and original take on helmets, but it feels like Ironman owns helmets. So perhaps a script will have to stay away from that even before it gets to the level when you get involved. Justin: Totally. You can’t even think about a helmet with UI moving in it without thinking of Robert Downey Jr’s face in the middle. That’s totally been cornered on that side of things. It did start a lot of cool looks and interest within HUD design. It feels like videos game’s have taken from this look and style as well. A lot of people work incredibly hard on these productions and there’s a great amount of work being done, a few key guys that launched an industry really. Kirill: Do you feel that the industry is just beginning? Justin: It’s hard to say where it’s going to go. Like you said, there’s a whole universe made for Marvel. They have all these different movies and all these different types of UI, and eventually I think they would want to have them all come together in some way. But what happens with that afterwards? Maybe there’s going to be someting new “Star Wars” that nobody has thought of or seen before. There always seems to be something that comes down the line to change things up. TRON seemed to be a very heavy influence for a long time. Kirill: You said that the market is getting saturated with more people on your side, but perhaps that means that the pie is growing and there’s just more work to be divided between all the people in the industry. Justin: With motion graphics I never saw it going this route [laughs]. That’s where largely the body of my work has been, working with these fantasy user interfaces. And lately I’ve been going to events like F5 and Blend Fest, there’s a lot of interactive set ups and I find that all quite interesting. I’m trying to immerse myself in the kind of work that I’ve never really been a part of before – the real side of things. I’m not a huge fan of coding but I do have an interest in looking into that more, to actually make real interfaces. Up until now I’ve been doing fake interfaces where I’m coming at them from an artistic standpoint really. Kirill: Would you see yourself wanting to transition into the world of designing screens and interactions for end-to-end user flows, with all the limitations of existing software platforms, hardware devices, planning and timelines? It’s a different world, but the impact might be more far reaching. Justin: I’ve moved into freelancing now and I’ve received a lot of requests for interface concept designs for mobile and console video games, or banking software. I kind of didn’t know what to think about it as I’ve always worked on the film and television side of things and it almost freaked me out a little bit to know that I would be involved in an actual product coming to life. I think it would be far more rewarding in the end. Sometimes you only see certain screens for five seconds in the background of a film, whereas if I make a concept and work with someone to make it real, it could last a lot longer. And here I’d like to thank Justin Kohse for graciously agreeing to answer a few questions I had about the art and craft of screen graphics and user interfaces for episodic television, and for sharing background materials. You can see more of Justin’s work at his main site and on Vimeo. You can also find him on Twitter and on Instagram. Stay tuned for more screen graphics interviews in 2016!